Love these! I was a bit hesitant because they are cheaper than many of the others I was looking at. They are plastic but I am putting them outside in the front of my house which gets a lot of sun and some of the other materials may not hold up. Super easy to put together. Only complaint is the screws aren’t black but for the price, I’ll happily spray paint them. 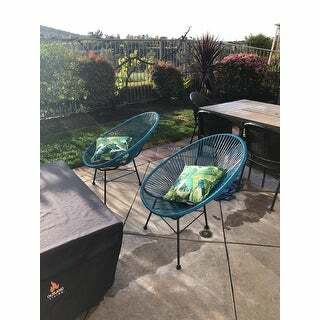 Add an unique aesthetic design to your patio and backyard with these Sarcelles wicker patio chairs by Corvus. 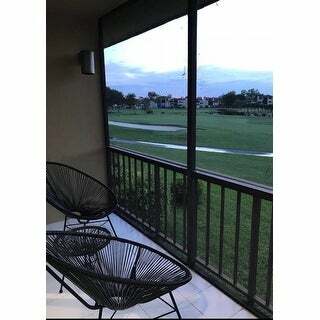 The outdoor chairs are made of metal frame and PE wicker for durable use in the outdoor areas. 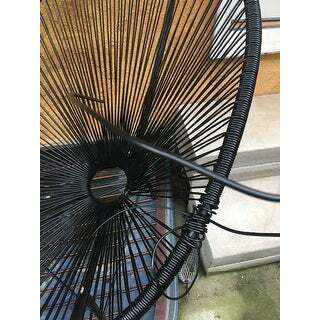 The wicker cord design forms supportive seats and offers ergonomic comfort for you and your guests to relax. These chairs shipped so quickly and they are so comfortable. The seats are really reclined, so they're great for sitting back and just staring off into the sky at clouds or stars. The cords are coated with a durable plastic and they have enough give that you feel comfortable, but not so much give that it feels like you're sinking. 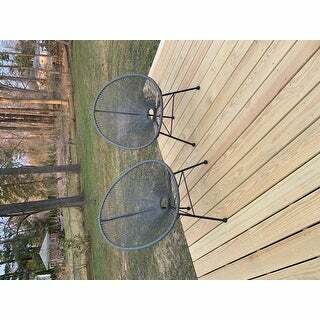 Love these for a modern look on the patio! The chairs look great and are easy to assemble. BUT you have to be a giant for these chairs to fit. They are HUGE! Still, attractive. I'll try decreasing the space for a human sitting in them by using waterproof or water-resistant cushions. I hope it works because they really are pretty and have exactly the look I want. 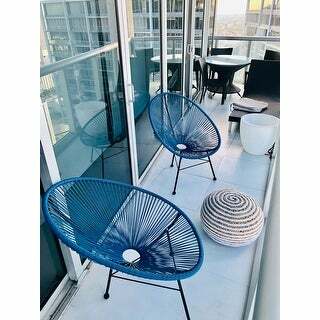 Recently moved to an ultra modern building in the hippest part of Chicago and boy oh boy these are perfect for our balcony! Comfortable! Bought the table too. Balcony=done! Thanks Overstock! These "Acapulco" style chairs arrived quickly and were fairly easy to assemble. I ordered the black, and they look great on the paver patio of my mid-century modern home. 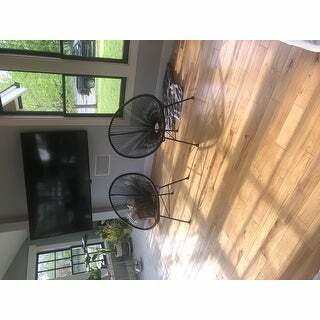 I bought these chairs as inexpensive accent chairs for my living room. I live at the beach and they turned out to be super functional, as I am often coming home slightly damp or sandy, and I do not have to worry about sitting down on upholstery. I am going to replace them with something more cushiony and put these outside eventually, but they ended up being perfect for a temporary stand in for my living room. 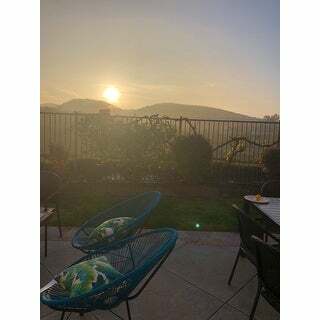 I gave them 4 stars because they aren’t the sturdiest chairs, they are very light weight and easy to tip over, even if you just bump them when walking by, but they are very comfortable to lounge in and will be the perfect addition to my covered patio set up once I find the perfect set of upholstered accent chairs for my beachy living room. They are great for the price. Absolutely love these chairs! I bought 4 of them to surround our fire pit and they are just perfect. They are the loveliest shade of peacock blue, sturdy, and really comfortable. I knew they were going to be comfortable from all the reviews I read, but my husband didn't know until he sat down and he was happily surprised. I would say that if you're looking for something that sits upright, these may not be the chairs for you as they do recline somewhat when you sit in them fully. 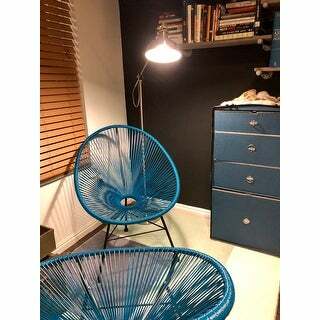 I searched for months for affordable Acapulco chairs and the value of these chairs can't be beat! Product arrived with damaged packaging but everything was in great condition. Easy to assemble (only legs needed bolting on), though a second set of hands to hold the chairs might have been nice. I ordered the "peacock" color, which in separate photos appear both teal and a more 'true' blue. These are definitely the teal color. Still really like the color! They seem relatively sturdy, but the chairs have a little flex in the base so will have to wait and see how it holds up. Very comfortable to sit in to me, but some may want to get a cushion of some sort depending how you like to sit in the chair. 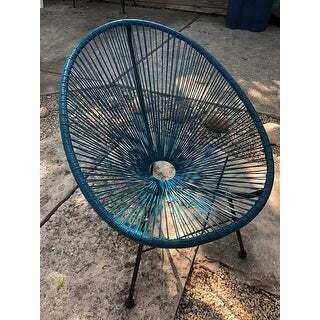 I fell in love with similar chairs in Oaxaca and had to add them to my yard after returning home. I have back issues and don't find many reclining chair very comfortable. These babies are an exception! They are stylish, minimalist, and super light so can be easily adjusted based on the best sun exposure on my patio. I'm really pleased with my purchase (and the price). One downside for your less coordinated guests--they can topple easily if someone leans to the side. I’m in love with them!! Very easy to assemble. The color is exactly as shown on website. They are perfect for lounging. I like the fact that they sit low. Adding an ottoman even makes them more comfortable to lounge for hours! Overall very happy with the look and style of them. Huge disappointment! I bought these chairs and assembled them alone. I thought they looked great. I put them in my back yard after assembling them and left them there while on vacation. 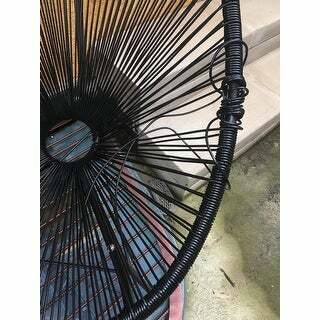 The first time I go there out to see the chairs, I see that some of the plastic “ropes” have snapped with NO usage. I don’t see how they could hold up in the long term. My backyard is completely enclosed and partially covered so I was shocked to see this. Annoyed that I need to return them after having gotten rid of the boxes! And it’s a little over 30 days since the purchase so Overstock doesn’t promise all of your money back! I ordered these chairs in the "blue". The picture shows more of a bright turquoise in nature. In reality, they are very dark teal. The frame is very reclined when you sit in it, which is different than other Acapulco chairs I have sat in, which have you sitting more straight up. Also, the frame is not very sturdy, and looks like it struggles to hold a 200lb man. I freaking love these chairs. shocked at how comfy they were. looks expensive. I added throw pillows so one doesn’t sit so far back in the chair. With side tables purchased from another store I can put my feet up and be very comfortable. However because I’m short I have a little trouble getting out of the chair. Assembly was easy. We saw similar chairs at a local store and decided to take a chance on this set. Super happy we purchased them. Look exactly like the photos. They are super comfy and look sleek and cool. We plan on buying the matching table. Love these chairs. They were easy to build as I did it by myself in about 20 minutes. 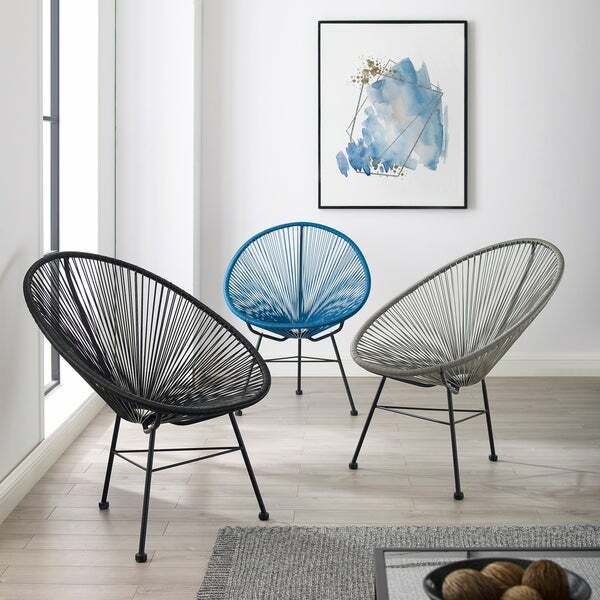 They are very comfortable to sit in whether sitting up straight in conversation or lounging. It’s not like similar chairs where you feel slouched the whole time. I added a decorative pillow to give it some color but it’s not needed as they are chic looking on my back deck. I will highly recommend these and may even purchase two more. They have been on my deck for about 3 weeks now and have held up great! Easy to put together, SO comfortable, and have held up great so far! I had been searching for Alcapolco chairs for a while that wouldn’t break the bank. These recline a bit more than we had expected, but they look really stylish. 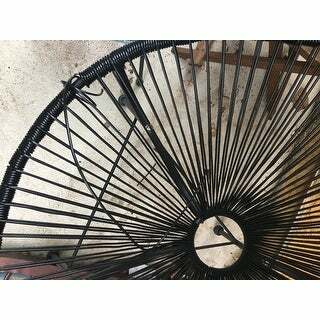 We got black & they work perfectly with our patio furniture. Great quality, awesome look. Maybe too awesome as they were stolen from our storefront, but we're ordering more. 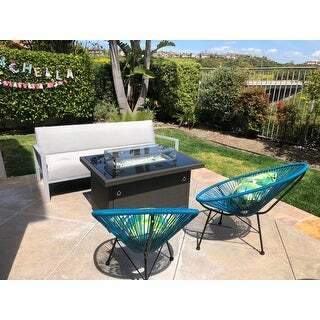 Cannot wait for summer... these chairs are so comfortable, perfect for stargazing. Sturdy enough but not as big as I thought they were. They were great outside for my preteen and her friends… Wound up buying bigger ones for adults to sit on for the front yard patio. "Hi What should be the maximum weight of the person , so the armchair can handle. Thanks"
"When will the black be in stock?" This is in stock now. "What’s the height from floor to the lowest point of the seat?" Dimensions: Overall dimensions: 34 inches high x 27.5 inches wide x 33 inches deep (each). Weight: 9.9 pounds (each). Seat height: 17.3 inches. I hope it helps. It is available for purchase now. I hope it helps. "Does Sarcelles BLUE color chairs match PEACOCK color table?" Yes. They match with each other. "are you going to get black color in?" Yes. the black color is now back in stock. "What is the seat height? (The dimensions given list the height but that is the measurement from the floor to the topmost part of the chair. I need the measurement from the floor to the base of the seat.)" It measures 17.3 inches high from the floor to the seat.